A horse’s hoof, tough as it may appear, is made from the same proteins as your own skin. In fact, a horse’s hoof is 95% protein. Many chemicals used in commercial hoof products can denature and thereby destroy the protective function of this protein. Formaldehyde, turpentine, pine tar and acetone will harden the hoof and make the hoof shine; however by chemically “cooking” the protein the hoof loses some of its elastic qualities and ability to absorb shocks. Shock absorption is a primary function of the hooves! A hoof wall without elasticity is more prone to cracking, and a hoof wall unable to “breathe” naturally cannot maintain healthy moisture content. 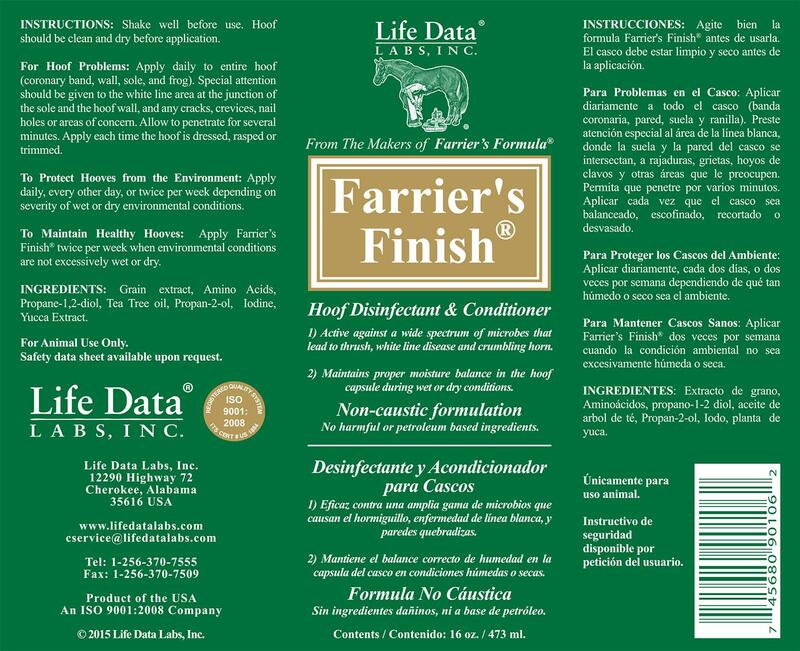 Farrier’s Finish® preserves proteins and supports elasticity of the hoof wall.